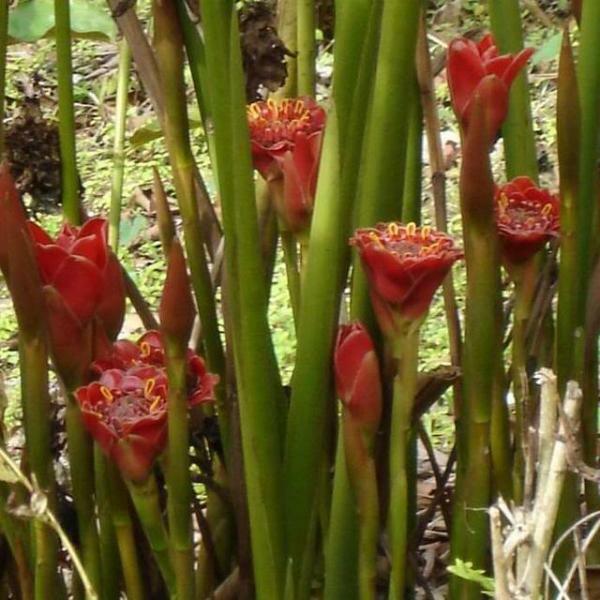 The Zingiberaceae family is simply huge and although they are closely related, the gingers belong to different genera including Globba, Alpinia, Elettaria, Hedychium, Curcuma, Kaempferia, Zingiber and Etlingera. Some species are evergreen, while others lose their leaves in winter. Most gingers have unusual, long-lasting flowers. Gingers differ in their cultural requirements, but generally they like a warm, humid climate, part shade and shelter from cold winds - in other words quite well suited to the Coffs Climate. They are so resilient to the heat and humidity AND have diverse, glorious flower rewards so a great inclusion in plant lists for our gardens, especially if you are wanting a tropical 'feel' to your garden. It would be impossible to list the full ginger family here however, the following are some that might be interesting to learn more about and perhaps plant. Also I write about plants that are not from the Zingiberaceae family including Blue Ginger and Costus, which have been reclassified as Costaceae. Galanga or Galangal have also their own listing as they are not all from the same genre. There are about 35 species of Globba and many cutivars giving variations. This is perhaps considered the hardiest of the so-called 'Thai Gingers'. All Globbas die back during the dry, cooler months here on the Coffs Coast. Over winter they store their energy in rhizomes and will spring back with vigour when the soil temperature rises in spring. 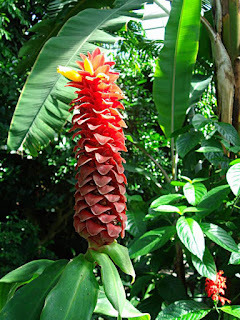 In general, they will grow 50-60cm tall and the foliage is typical of the ginger family with leaves tightly furled up the stem. The dainty inflorescences appear in late summer and early autumn and are comprised of colourful bracts holding tiny dangling yellow flowers on slim spikes which is where it gets the common names of Dancing Ladies Ginger, Dancing Girls Ginger and Jungle Jewels Ginger. Like many gingers, the bracts stay showy for a long time and make for wonderful cut flowers. 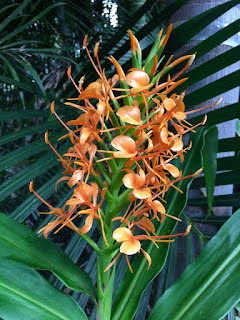 This ginger is marvellous in full or part shade but does get a bit untidy when it dies down during the cooler months. If you'd like to share, propagation is from division of the rhizome. A non-invasive variety which reproduces by rhizome expansion, staying in easy-to-maintain clumps. 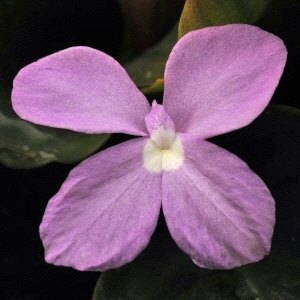 G. winitii has cultivars such as Dancing Girl, White Dragon and Princess Kim. They never stop multiplying no matter how you may neglect them. As cut flowers they are just amazing. Stems picked in late summer will last for up to four months inside, even throwing out roots for the next summer! The beautiful bracts range in colour from magenta through to white. Some history about this ginger. In Thailand it is called Dok Khao Pansa, Dok means flower and Khao Pansa is a Buddhist festivity held the day after the August full moon marking the beginning of the rainy season and the beginning of the Buddhist lent. From Khao Pansa until the end of the rainy season (Aok Pansa) about three months later, Buddhist monks stay in the temple and refrain from wandering around, as seeds are sprouting at this time of the year and monks should not step on the new growth. Dancing lady ginger is dormant most of the year, the plant comes back to life with the end of the hot season in June or July in Thailand. Unlike its cousin G. schomburgkii can be invasive as they produce a bulbil after the flower drops. The bulbils are about 1-3mm in length and will result in many, many new plants around the old plant the following summer. Only a very diligent gardener will keep this one in check! 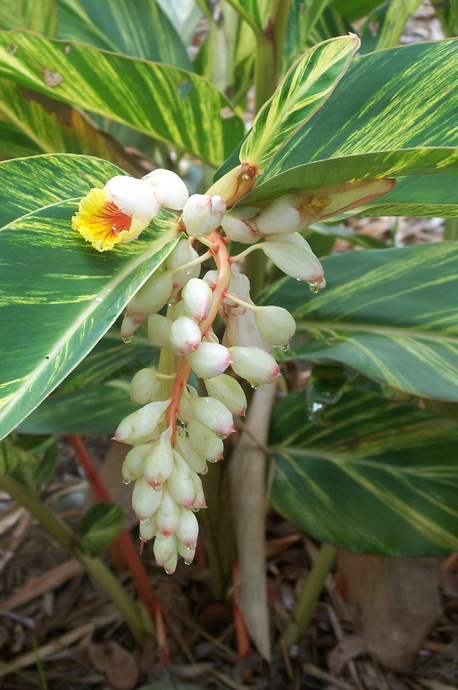 Alpinia is the largest genus in the ginger family and has up to 230 known species. They are hardy, tight clumping rhizomatous plants with large, mid green leaves and they come in all shapes, sizes and forms and are loosely known as 'shell gingers'. Pictured above, is a terrific landscaping plant A. zurumbet, it has lovely large mid green foliage which can be used as a low screen and has a dense growth habit from its clumping base. The flowers appear in spring on drooping racemes and the flower buds are white with a pink tinged tip and flower throughout summer. As they open they reveal vibrant yellow lips with red markings. 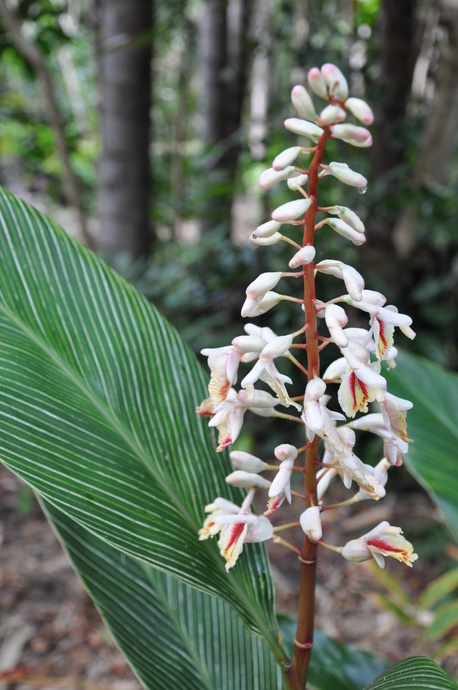 A. zerumbet gets its shell ginger name because the flowers resemble drooping sea shells. Protection from the harsh afternoon sun is imperative, so choose a site that is either in full shade or partial shade, especially during the afternoon. A. Zerumbut 'variegata' is a stunning variegated foliage ginger to 1.5m high and is just excellent to bring some contrasting light to a shaded spot with its beautiful variegated lime foliage. The flowers are delightful - waxy buds opening to the typical zurumbet red shell-like blooms. Zerumbut will clump over time however, it's a lovely ginger to share with friends when you need to reduce the clump. This is sometimes known as Cardamom Leaf, Cinnamon Ginger or False Cardamom. The name comes from the distinctive cardamom fragrance that comes from the leaves when rubbed or crushed. It's the leaves of the plant that are used for culinary purposes (mainly as a fragrant wrap) and used as a medicinal plant too. It has linear shoots and dark green leaves. They produce the pretty white, shell-like flowers during summer. 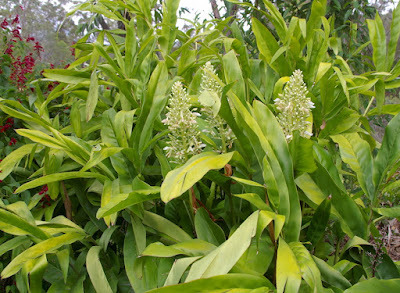 The native ginger is an edible perennial herb, and is a good bush tucker plant. The fragrant white flowers are followed by blue berries. 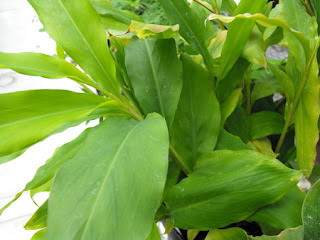 The new leaf shoots and berries have a mild ginger flavour and can be used in cooking or eaten fresh from the plant. It forms a clump to two metres tall and is extremely hardy. It seems to grow anywhere but cultural notes say it likes a lightly shaded to full shade spot and can be used indoors. Cut back hard to make it look tidy as it does tend to get a bit shaggy! Take care not to confuse Native Ginger with the invasive weed Hedychium gardneranum a tall growing perennial with very fragrant creamy yellow flowers. 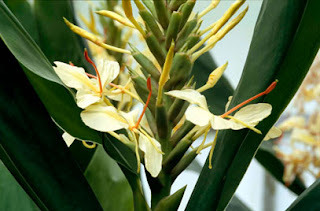 The Hedychium species is mentioned later in this post. This is an interesting ginger in that (I guess you can tell from it's name) grows in shallow water with broad upright foliage to 1.5m. It has attractive small light pink flowers. Can also be grown in water-logged or boggy ground, so could be quite a useful addition to perhaps a problematic area of the garden. Unlike the aquatica above, A. formosana likes a well drained soil. It has very attractive foliage featuring glossy, green and cream finely striped leaves and large inflorescence of pink and white flowers in spring. 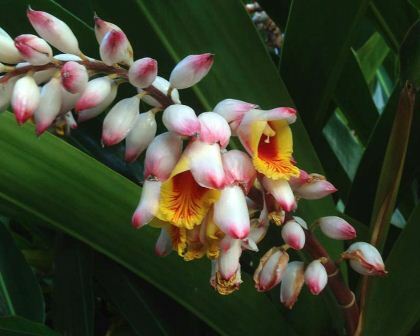 It prefers tropical or sub-tropical conditions but can endure some frost. This ginger is a 'statement' plant where textural or contrast differences are needed. Elletaria is also a genus of plants in the Zingiberaceae family, there are 11 accepted species names in this genus. It is native to India, Sri Lanka, Borneo, Sumatra and Malaysia. Elettaria cardamomum is the world's third most valuable spice by weight (after saffron and vanilla). It is sometimes referred to as the 'queen of spices' alongside black pepper (Piper nigrum) which is known as the 'king of spices'. The fruit capsules are harvested before they are fully ripe and have been used as a spice and in medicines since the 4th century BC. The plant grows 2 - 5.5m in height, so is no shrinking violet! It grows wild in the monsoonal forests of South India and Sri Lanka. German coffee planter Oscar Majus Kloeffer introduced cardamom to cultivation in Guatemala in the early 1900s and has been hugely successful as a commercial crop. Up until about 1980 India was the world's largest producer but Guatemala has now surpassed India as the largest producer and exporter. Hedychium, ginger lilies or butterfly gingers are also part of the Zingerberaceae family. There are approximately 70-80 known species. They, like most gingers are very easy to grow here on the Coffs Coast as long as they are in a shadier part of the garden with moist soil. As Hedychiums come from a monsoonal climate it is vital that these plants get their fair share of water during the summer although they will let you know their unhappiness if parched by their leaves curling up! This should be considered when choosing their position, perhaps not place them near any other water guzzlers. 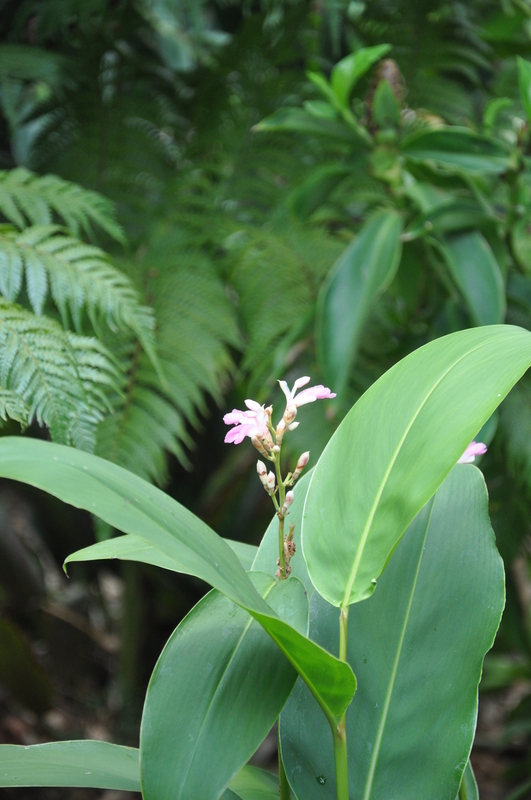 One advantage of Hedychiums over Alpinia varieties is that they will produce flowers usually on the current year's growth. Flower sizes vary between the different varieties but all of them possess one thing in common - a strong fragrance. The most widely grown is H. gardnerianum (Kahili ginger). 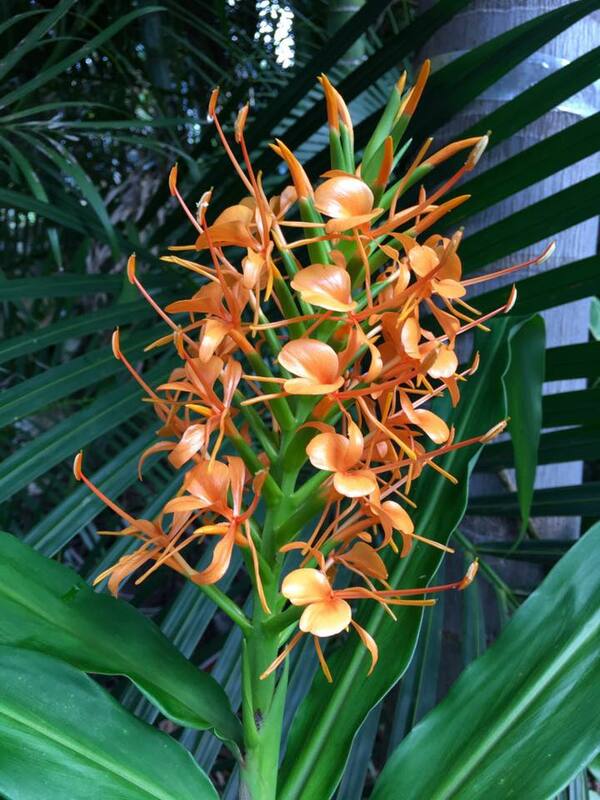 It is considered by many to be the pinnacle of the gingers - producing a 30-60cm flower spike atop a 180cm stem! Due to its social habit of getting out and about this plant has become quite a problem further north where it has become quite weedy. It might be suggested that perhaps this is one for a pot. H. coronarium has perfumed white flowers on a compact clumping plant that looks like moths which has given it the common name of 'Luna Moth'. It's shorter than most gingers growing up to 1.5 metres. This ginger prefers moist shade and one suggestion has been to grow it under a frangipani. Feed freely and cut old leaves back to the ground in late winter to freshen the clump and promote new growth. 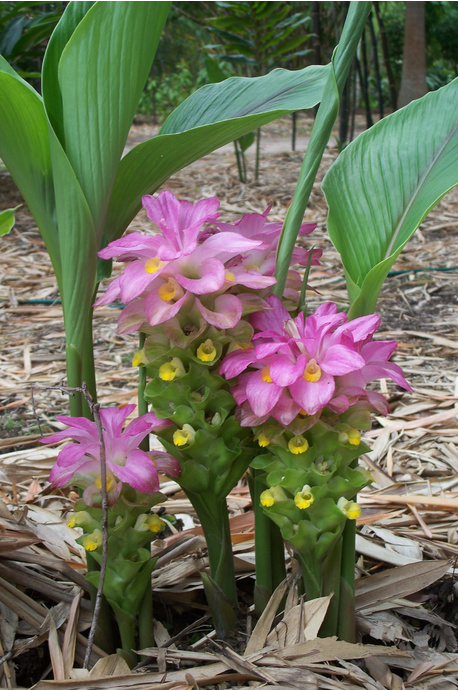 Curcuma is a genus of about 100 accepted species and they are native to Southeast Asia, Southern China, the Indian Subcontinent, New Guinea and northern Australia. The name comes from the Arabic 'kurkum' meaning turmeric. 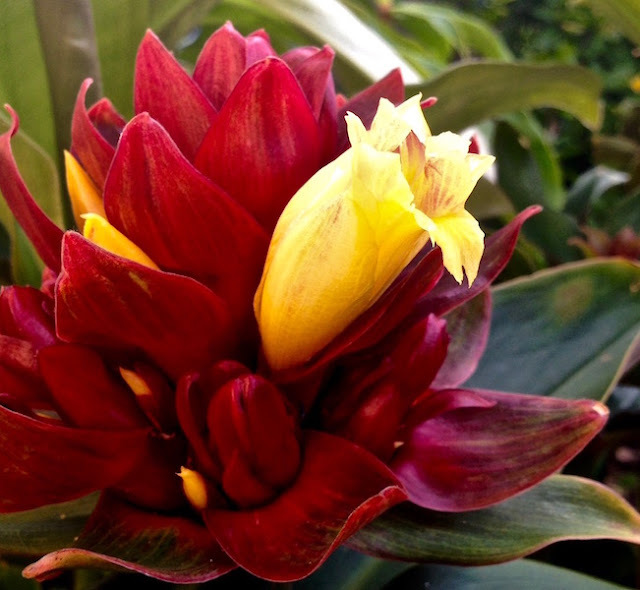 Curcuma is perfect for pot culture and small gardens. They have broad, veined leaves and small, brightly coloured flowers which emerge from large bracts. The flowers range in colour from white to pink, orange and shades of violet. The flower spikes last for several weeks. C. domestica is also known as C. longa. A deciduous ginger which grows to about 60-70cm in height and better known as Turmeric. Roots can be harvested in Autumn or Winter and eaten fresh or dried and ground. It is also used for dyeing cloth. The flowers make great cut flowers and will last well in the vase. This ginger will tolerate quite cold temperatures so will grow well in most parts of Australia. Position in either full sun to part shade in moist well drained soil which has been enriched with organic matter. Flowers in Spring/Summer and grows quite well here on the Coffs Coast. C. australasica - Cape York Lily and is native to the Cape York area of Australia and can be used as a spice in cooking in much the same way as its Asian relative, C. domestica. 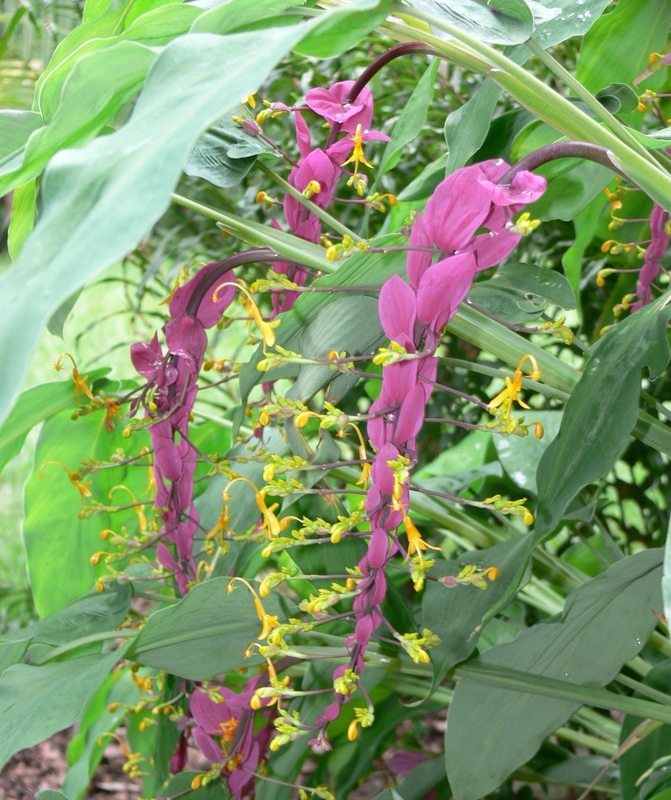 This ginger also makes a great ornamental plant with its pretty mauve bracts and yellow flowers. It grows from 0.5-1m and is cold tolerant. It enjoys similar growing conditions as turmeric - that is full to part shade, in moist well drained soil, enriched with organic matter. It flowers in early spring and is deciduous. 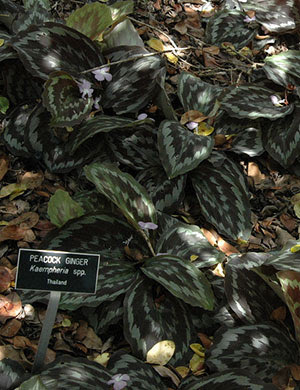 Kaempferia or Peacock gingers are often grown for their attractive foliage and colourful flowers. They spread slowly and can be used as a ground cover for a small area. They grow well in shade in moist well-drained soil. Kaempferia grow from small globular rhizomes with fleshy roots. Some of these cute little ginger species have flowers that emerge in early spring just before the leaves appear, but in others they emerge along with or after the leaves and continue to flower all summer. The exact number of this species is undecided, but experts agree that some have not yet been found, much less been given a name! See also K. galanga under the heading of Galanga later in this post. K. pulcra Bronze Peacock has bronze-coloured leaves with a satiny sheen. Flowers are lavender with a white centre and are produced throughout the summer and early autumn. Their habit of hugging the ground make them a perfect choice for a ground cover. Pictured left is the pretty little flower from K. pulcra Bronze Peacock. The unusual attractive, long lasting, colourful basal cones and luxuriant foliage of beehive gingers have always held great appeal for people. They are named beehive due to their similarity to a Skep beehive. The leaves are long and oblong with a beautiful lush tropical appearance. This group of gingers is native to Thailand so does like a tropical climate. A CHGC member has grown Beehive ginger quite successfully in his Coffs Harbour garden. The true flowers emerge from under the scales of the cones. They are pretty and orchid like and unusual but due to size only spectacular to the discerning! 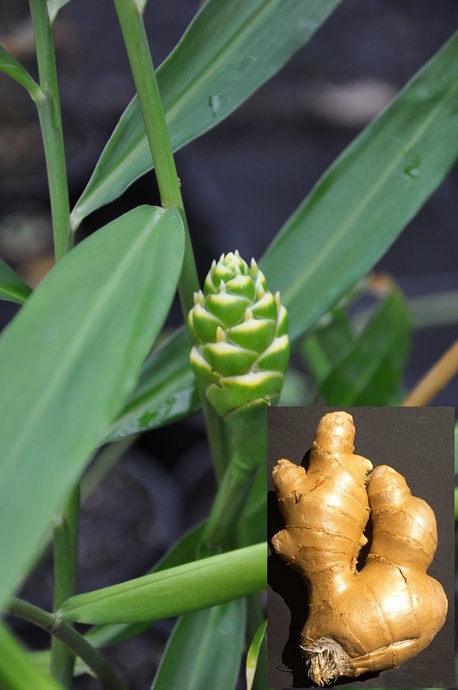 This ginger species was Flower of the Month in April 2016 - see link for further details. Z. Spectabile grow 2.5 -3m tall and have flowers that are beehive-shaped cones that appear on a short spike that arises from the base of the plant. 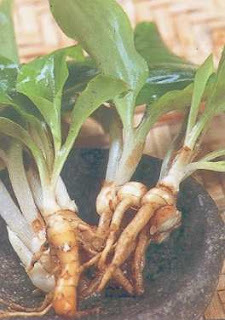 They develop a strong rhizome from which new shoots emerge. This rhizome will get bigger annually. The cones will last for many months. They may start off yellow in colour but as they age, turn red. Grow protected from direct afternoon sun as their leaves will burn. Give adequate moisture to maintain good healthy growth. A great landscaping plant producing apricot coloured inflorescence during summer, which tend to get quite dark red in Autumn. 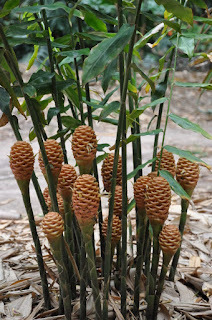 Commonly known as dwarf beehive ginger because it has small basal cones and also terminal cones.It grows from 2-2.5 metres and prefers part shade. The growth habit is tight clumping with upright stems. It likes moist well drained soil, rich in organic matter. The flowers appear in Summer and will last until Autumn. True edible ginger, Z. officinale is possibly native to India. It is very widely grown as a commercial crop in south and southeast Asia, tropical Africa, Latin America, the Caribbean and Australia - it grows very well on the Coffs Coast. The shoots grow up to 1.2m tall and arise annually from buds on the rhizome. These shoots (pseudostems) are formed from a series of leaf bases (sheaths) wrapped tightly around one another with the long, narrow mid-green leaf blades arranged alternately. Z. officinale needs lots of water and regular feeding to do excellently. When the leaves die down in late autumn, the ginger is ready to harvest, though best results are achieved by postponing this until the second year. Harvest the older roots to use in the kitchen, leaving some of the young roots to re-sprout. The optimum time for planting new rhizomes is in the early spring. ABC Gardening Australia's Jerry Colby-Williams showed how to lift and divide Zingiber ginger on Series 28 Episode 12. 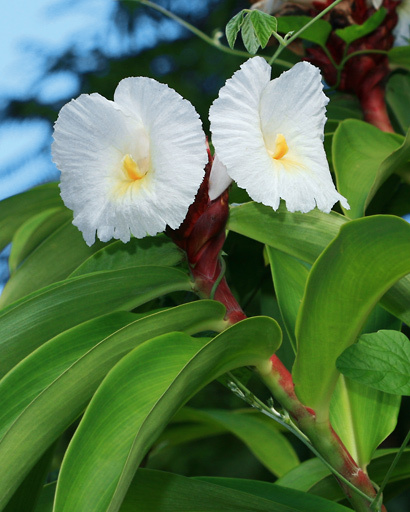 Costus species have a spectacular flower spike, it is related to the gingers and was originally part of the Zingiberaceae family, but now the Costus species have been reclassified into their own family - Costaceae. 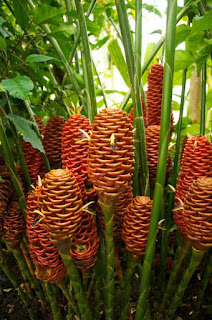 Commonly known as spiral ginger and native to tropical and subtropical areas of Africa, Asia and South America. 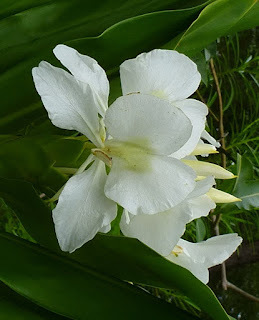 There are at least 90 different varieties of Costus with each rhizome producing a single flower. It's important that this rhizome is kept dry during winter (so suits our Coffs winter), but in spring, when new growth starts, it is imperative that it be well watered and fertilised. They like dappled shade as their leaves will burn in full sun. In winter cut them down to ground level as they become quite untidy as the flower stems die off. Our tropical/sub-tropical guru has more information, Gavin's ginger presentation which he presented at our 18 April 2016 meeting. 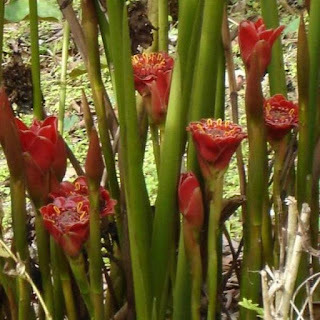 This ginger is commonly known as Red Tower Ginger or Red Velvet and is also the most hardy of the Costus species. This beautiful Costus was incorrectly identified many years ago. It is always sold under the name Costus barbatus, but the true Costus barbatus is not in cultivation - this is a native of Costa Rica and quite rare. The brilliant red inflorescence are stunning and they flower for long periods and make a great cut flower too. One thing to remember is that this will not bloom on current year's growth like most Costus will. If desired (and once established), the removal of the lower foliage will highlight the beautiful stems that 'spiral' upwards. 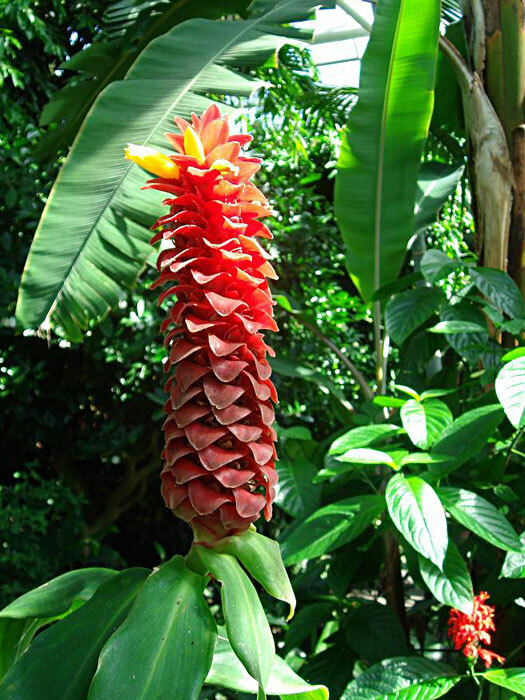 The showy flowers of this commonly known Crepe Ginger emerge from between dark red to reddish purple bracts on pinecone-shaped, terminal inflorescences. The individual flowers are trumpet-shaped, up to 10cm across and have three fused, crinkled, crepe paper-like white petals and a smaller, yellow curved petal-like stamen. These flowers are followed by round 1.5cm red seed capsules containing black seeds and white flesh. The leaves are green, alternate and spirally arranged along the stem. The cana-like stems emerge from underground rhizomes and are upright, unbranched and green to dark red in colour. Crepe ginger is a source of diosgenin, a compound used for the commercial production of various steroids, such as progesterone. Red and pink are the most common Torch (or Tulip) Gingers. However there are many other interesting varieties that are gaining popularity with gardeners as they realise just how easy they are to grow. For some of us here on the Coffs Coast these are the ginger of choice as they are more tolerant of our heavy clay soils. 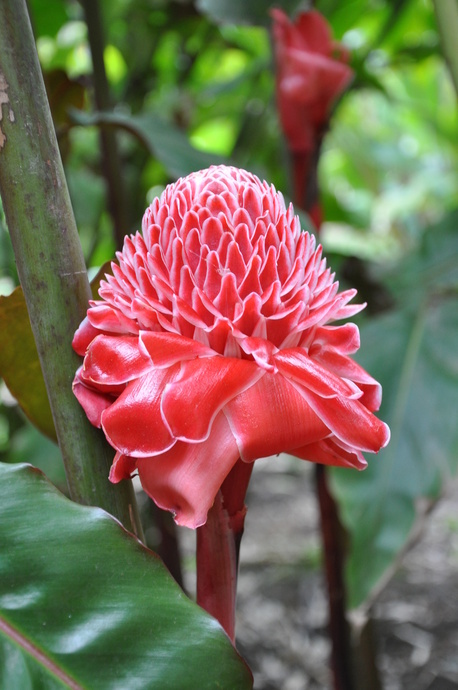 E. elatior 'red torch' is a massive ginger which can grow up from 3-4m high depending on growing conditions - some even grow to an incredible 7m high! This is a very shallow rotted plant with the rhizomes sitting close to the top of the soil. The wonderful flowers grow on a separate stem that emerge from the base and these stems can reach well over 1m. The bottom of the stems and underground rhizomes tend to be quite a dark red colour. Over time the rhizomes will spread and form a natural clump. Keep moist and well fed during the growing season for optimal flowering. Found in Malaysia and Thailand, the flowers that are in bud form are edible and are used in stir fries and salads as well as laksa. E. Haemispherica 'Helani Tulip' is an interesting variety of Torch ginger as the flowers differ to normal torch gingers because they don't fully open out, but form a tulip shape. They are dark pink to red with yellow highlights in the centre and make spectacular cut flowers and last a long time. They require regular watering and fertilising during the growing season and like a full sun to part shade position (although it will grow taller in a more shaded area. 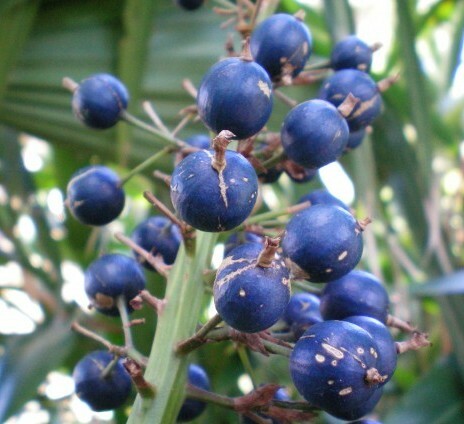 Dichorisandra thyrisiflora is colloquially known as blue ginger, however it is not related to the Zingiberaceae family. It belongs instead to the Commelinaceae family of plants which includes the various Tradescantia species (spiderworts). It is an exotic perennial plant from Brazil which grows up to 2m from thick, rhizomatous roots which has a clumping habit. It is best grown in partial shade and sheltered from the hot afternoon sun in summer and protected from strong winds that can damage the tall stems. It generally blooms in autumn. 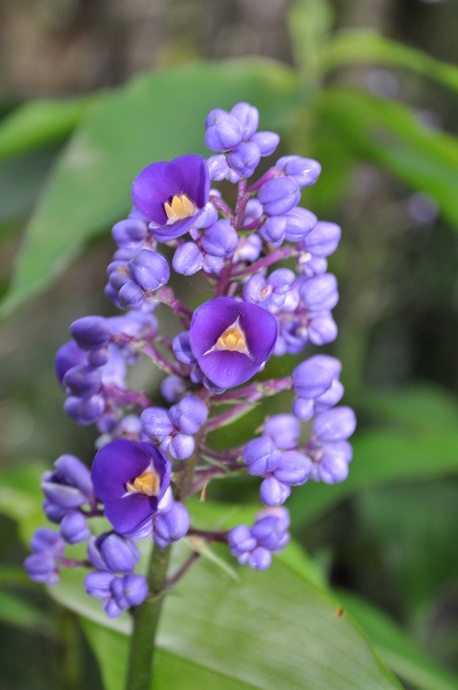 The beautiful clustered lapis lazuli blue flower spires appear atop ginger-like stems of leaves (which sometimes have a purplish underside). Dichorisandra thyrisiflora require fertile soil and reasonable moisture however they can survive extended periods without rain mainly due to it having golf ball-sized storage roots growing deeper in the soil than the rhizomes. As there are three different Galanga it is felt that perhaps they should have their own section in this post. Galangal has been imported in large quantities to Europe ever since the Middle Ages to be used as a medicine and as a spice. Galangal over the ages has been used in Europe and Asia as an aphrodisiac and medicinally as a carminative to relieve primarily, flatulence and nausea. It has antibacterial properties that are much sought after for making homeopathic medicine in India. 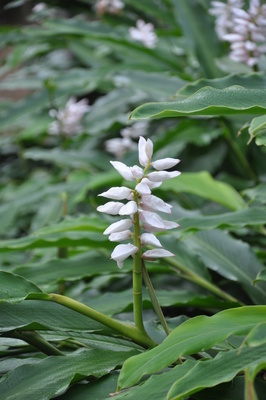 It is an immensely pungent and fiery rhizome related to the common ginger but with a personality distinctly its own. A. galanga is known colloquially as Greater Galangal, Thai Galangal or Laos Root. The plant grows from white rhizomes in clumps of stiff stalks up to 2m in height with abundant long blade-like leaves that bear red fruit. It is native to South Asia and Indonesia and cultivated in Malaysia, Laos and Thailand. 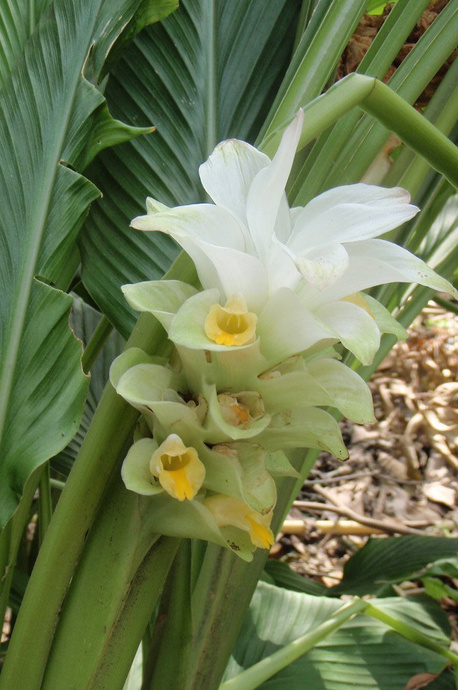 A. galanga is the galangal used most often in Thai cookery, almost to the exclusion of ginger, and has earned the title of Siamese or Thai ginger - in short it is to Thai cooking what common ginger is to Chinese cooking! The fresh root is fleshy, knobbly and very firm, to the point of being quite woody when it is fully mature. When very fresh, its ivory colour, with hardly any separation between skin and flesh and its young pink shoots are reminiscent of the appearance of young ginger. But unlike its better-known cousin, it is much denser and harder with ringlike markings spaced almost evenly apart, a glossy outer sheen and a unique mustard-like flavour with a sharper 'kick' than ginger. The red fruit is used in traditional Chinese medicine and has a flavour very similar to cardamom. 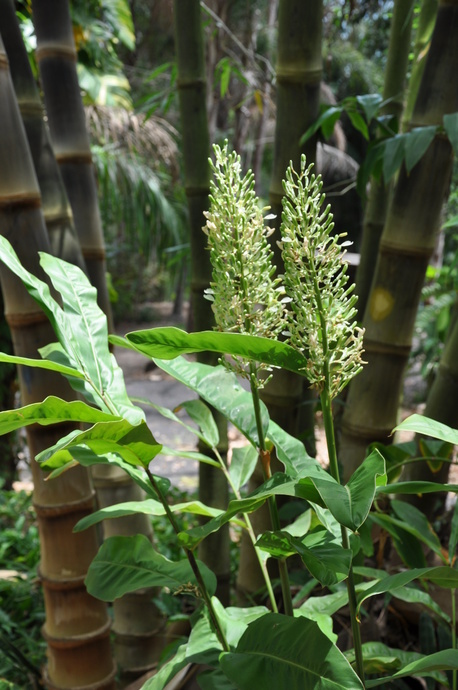 A. officinarum is commonly known as lesser galangal and has red-brown roots which mostly grows on the southeast coast of China (where it originated and attained its name) and in India. As its common name implies A. officinarum produces slender leaves that reach no more than a metre (about half the size of A. galanga). The flavour from its red-brown rhizome is peppery and more pungent than A. galanga with a pine-like aroma and is mostly used in medicinal applications rather than cooking. Kaempferia galanga is commonly known as kencur, aromatic ginger, sand ginger, cutcherry or resurrection lily. It is a Monocotyledonous plant and is found primarily in open areas in Indonesia, southern China, Taiwan, Cambodia and India, but is widely cultivated throughout Southeast Asia. 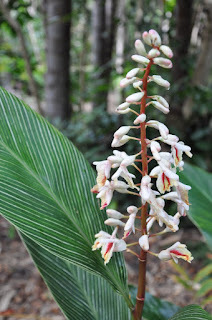 This galanga is differentiated from other galangal by the absence of stem and the leaves arise and cover the ground horizontally with dark brown, rounded rhizomes. It has a soft, musk/pepper scent and the flowers have an amazing orchid-like appearance and scent. This post has only scratched the surface on understanding the different genre throughout the family of Zingiberaceae. There is a massive amount of material written about this popular plant family available. Making a choice on what to plant might be difficult as they all bring something unique to gardens.